Sometimes I wake up, get bright ideas, try them and hope for the best. Today I woke up with a craving for pasta. 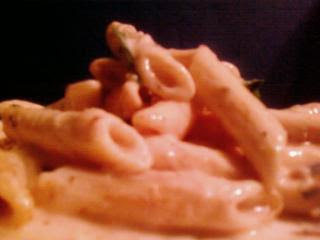 I should have been using last night's fish with grits for a meal today, but the penne was calling my name. Melt buttery spread in a saucepan over medium heat. Add half and half, stirring constantly. Stir in salt, nutmeg, grated Parmesan cheese, and grated Romano cheese. Stir constantly until melted, then mix in Eggbeaters. Simmer over medium low heat for 3 to 5 minutes. Garnish with additional grated Parmesan cheese, if desired. I added freshly diced tomatoes and chopped parsley on my plate. Shredded chicken seemed to be popular in the house this morning too. Apparently, Eggbeaters has a new product out with egg yolk in it. It tastes just like the original. Fettucine noodles, of course, are classic, but egg noodles, penne, orecchiette, (conchglie) shells, or rotini might work well too. Have you also found that if you allow the fat-free (or low-fat) half & half to come to a boil, it separates? I love the stuff, but you have to be really careful and watch it with an eagle-eye while it cooks. Worth it, though, for the creaminess without the fat of the "real" stuff! Yes! I think it's the high water content that makes it separate.